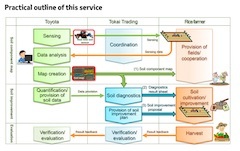 TOKYO, Mar, 26 2019 - (JCN Newswire) - Toyota Motor Corporation (TMC) begins field trials today of a new support service that uses data from real-time visualization of soil components during agricultural land analysis to diagnose soil characteristics and propose improvements. The aim of this service is to rapidly identify variations in soil components within a tract of agricultural land, and to help improve agricultural productivity and lower environmental impacts by enabling precise soil cultivation through waste-free addition of fertilizers and other soil improvement agents. This field trial is being carried out on farmland in Mie Prefecture in cooperation with Tokai Trading Co., Ltd., which has a wide range of know-how related to agricultural machinery and fertilizers, as well as extensive contacts in the farming industry. Toyota is pursuing various ways of applying its automotive production management and process improvement know-how to address issues faced by agriculture, such as the aging of the farming population and declining food self-sufficiency, with the aim of helping to resolve a range of environmental and societal issues, and realize a more sustainable society. One specific example is the Housaku-Keikaku agricultural IT management tool that Toyota launched in 2014 as a cloud-based solutions service that adopts the principles of the Toyota Production System to improve agricultural efficiency. 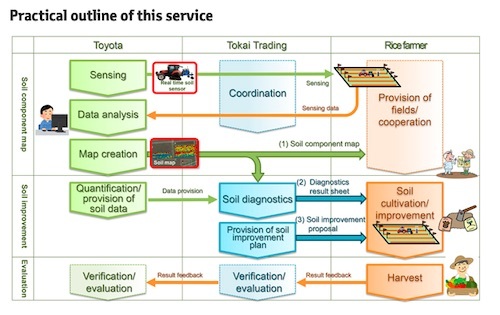 Additionally, focusing on intelligent agricultural technologies capable of carrying out data-centric cultivation management, Toyota has been conducting research and development related to Real-time Soil Sensor in partnership with Tokyo University of Agriculture and Technology and Professor Sakae Shibusawa. Between starting this project in August 2017 and November 2018, the research team has been validating the effectiveness of these technologies in rice fields in Shinshiro City, Aichi Prefecture. Today's announcement heralds the start of a trial to verify the commercial feasibility of a service based on this technology in rice farms in Mie Prefecture as a joint project with Tokai Trading. The trial is expected to continue until December 2019. Going forward, Toyota intends to continue addressing agricultural and environmental issues through new agricultural support projects, while working to expand the adoption of the developed service throughout the agricultural sector in other regions.